in both cases when i add padding the element total width and height get bigger. do i miss something here? thanks @bradyvossler but still why they both look the same when previewing? I should have “completely” read your original post. Hope this explains the difference. @pdxdave can you see in both cases the div still getting bigger if you add more padding? Not sure what you mean. I’ve included a screenshot. Notice how I increased the padding to 40px. The box1 (which is hovered showing its size ) is still 200px by 200px. Box2 is 290px by 290px. and if you add 300px padding, they both change size. doesn’t the one with the border-box value should still stay the same? Maybe you can help me out. 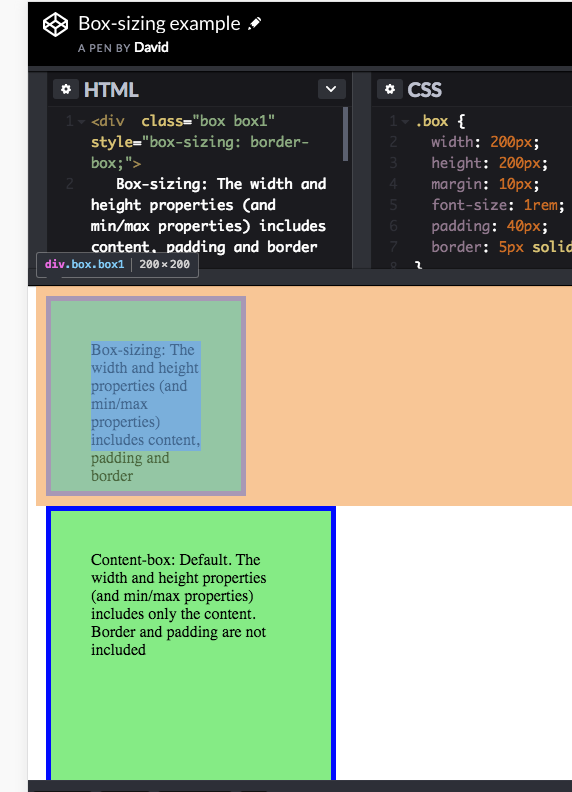 In what scenario would you make a box that’s 200px by 200px then give it 300px of padding? Why not just make the initial size of the box bigger? I’m just thinking of this in terms of a practical solution rather than major extremes. @pdxdave you are right it doesn’t change. 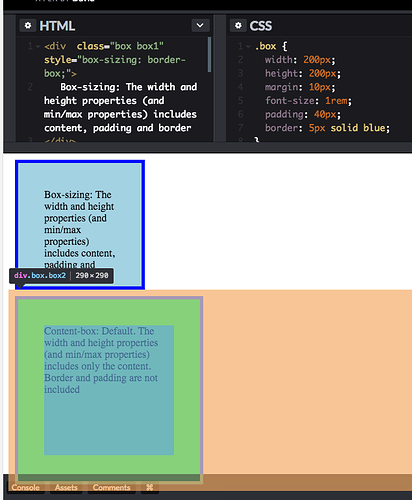 what i missed is that if you use more padding than the element’s width then the element will grow larger.